Happy October Monthly DIY Challenge day!!!! Yayyy!!! If you've never heard of our Monthly DIY Challenge, you can find out more here. This month, we're playing with Sharpies!!! 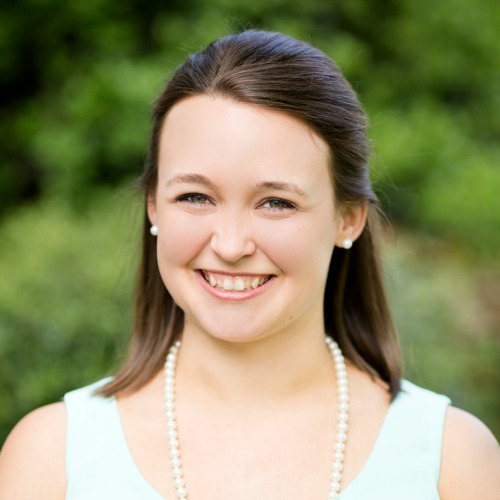 Thank goodness, because with the One Room Challenge in full swing, I needed something simple that I could get done quickly!!! 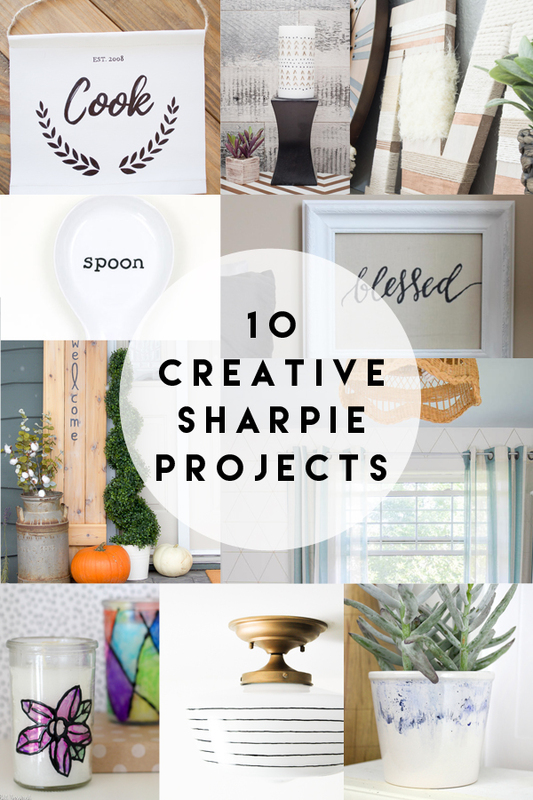 Have you seen all those Sharpie mugs on Pinterest?? Well those gave me an idea... We've been needing a spoon rest for a while. You see, my husband makes the coffee every morning, and brings me a hot cup of Joe in bed. Isn't he the best? Seriously, the best. 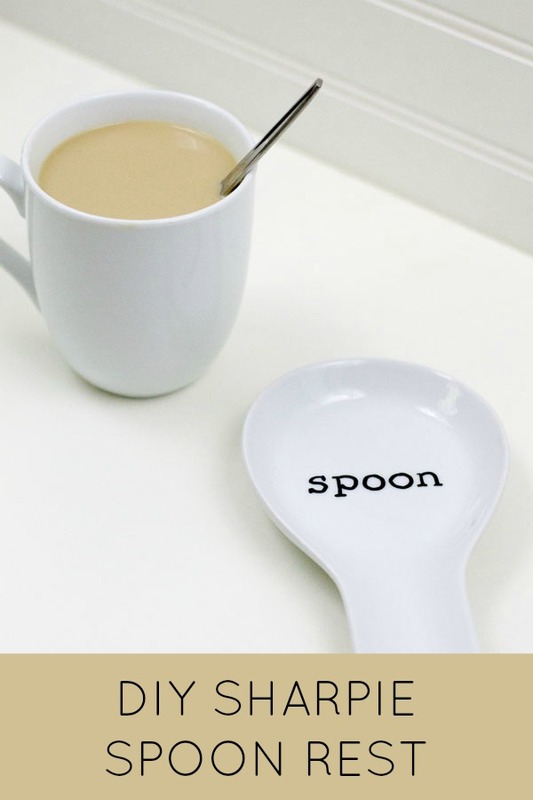 But I like my coffee sweet and creamy, and there is no where to put the sticky spoon he uses to stir my coffee. So the counter ends up being a big mess. 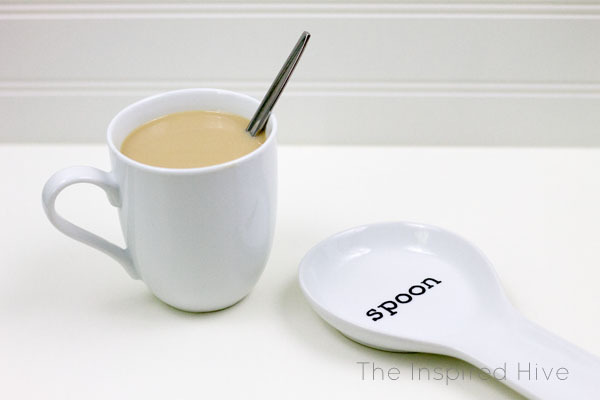 So I've been on the hunt for a simple looking spoon rest specifically for our coffee area. Well, spoon rests are all either plain Jane, or have roosters and vegetables all over them! This month's challenge gave me the opportunity to create one that actually goes with our style. This is probably one of the easiest projects I have ever done, y'all. Seriously. 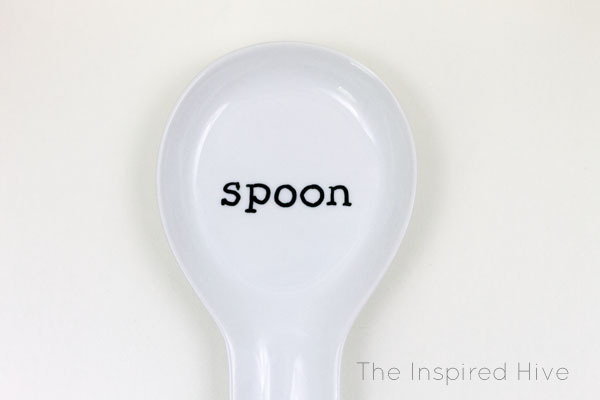 I wanted it to be simple with a somewhat farmhouse vibe, so I picked an oldschool font to add the word "spoon" to it, but you could also add patterns or drawings and use different colors if that suits your taste better. The best thing about Sharpies is that anything goes!!! Here's how I created mine! 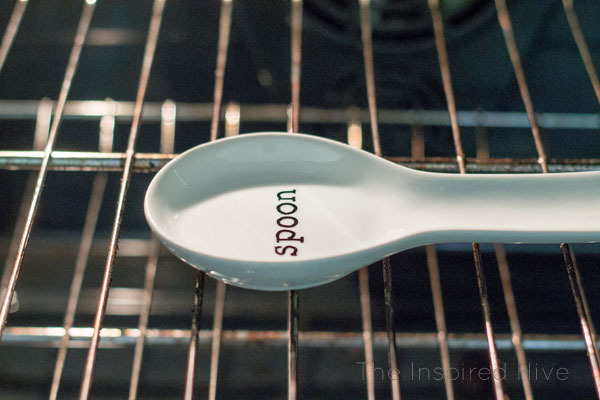 First clean the spoon rest with rubbing alcohol and cotton balls to remove dirt and oil residue from your fingers. Let it dry and then try not to touch the clean surface! 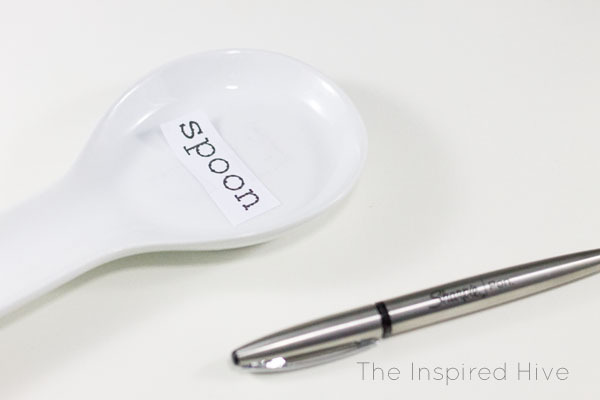 Once you've printed your design or text, tape it to the spoon rest. Use the Sharpie pen to dot over the design. I held the pen in each spot for about 3-4 seconds. 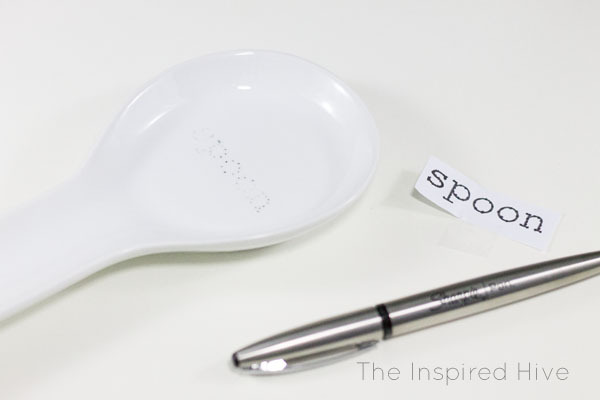 The goal is to leave a traceable pattern on the spoon rest by allowing the ink to bleed through the paper. Tracing the whole thing would take too long since it takes a few seconds to bleed through, so I opted for a dot to dot pattern. 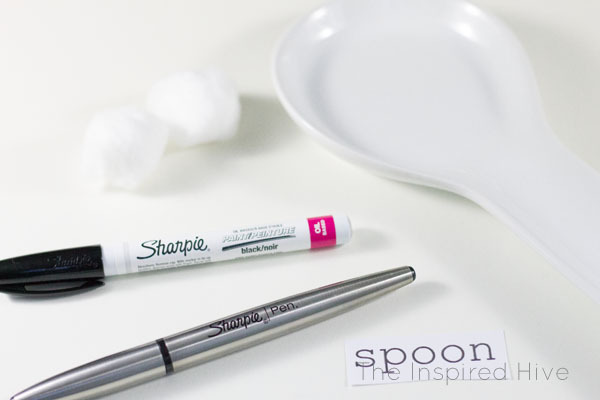 Allow your dots to dry for a few minutes so you don't have any smudging. The Sharpie pen will not withstand the dishwasher, so now we will switch to oil based instead. Use the oil based Sharpie to connect the dots. Allow to dry again. That's it! 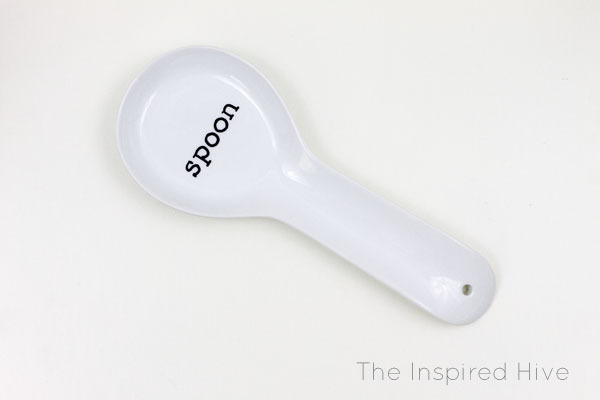 You now have a decorated spoon rest that is dishwasher safe!! I told you it was easy!!! And now our coffee area will be free of sticky sugar and creamer messes! 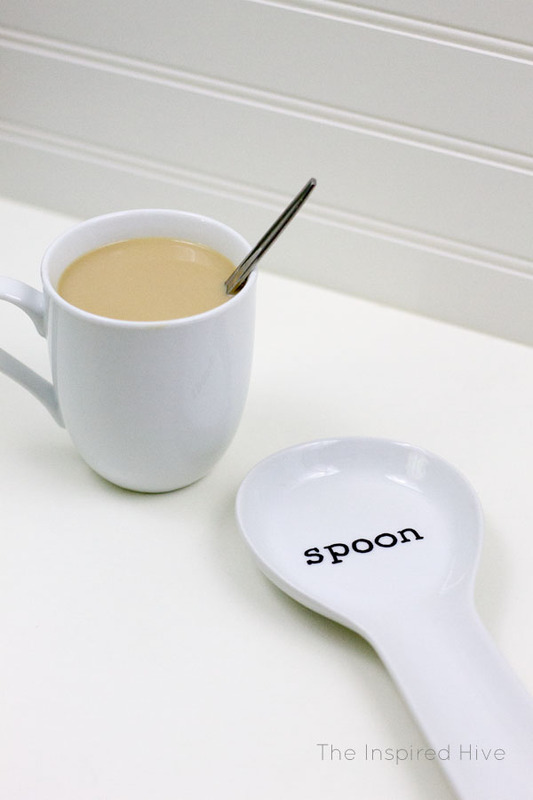 We're creating a coffee bar as part of our kitchen makeover for the One Room Challenge, and I can't wait to put our new spoon rest on it! This is a really cool idea and perfect for a personalized gift. I love it! Our counter always gets so icky from coffee and tea residue! This is the perfect solution! So cute! 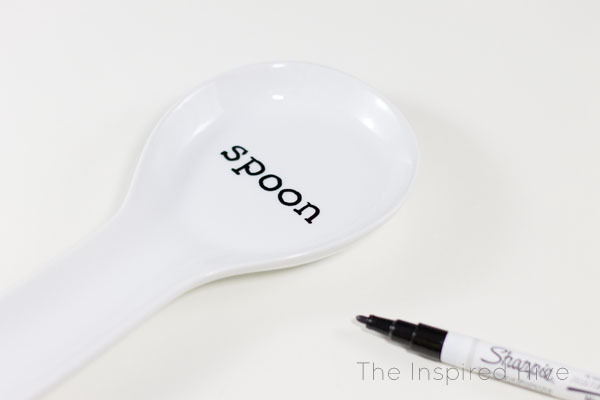 What a clever way to transfer your font to the spoon rest! I love how simple this is - it would fit so well in any number of kitchen design styles! Super cute, my friend! I love the technique for getting a great font on there, too. I am pinning to remember to try it! What a great idea, Nicole! You're totally right about them usually covered in roosters or fruits and veggies! Yours is super cute!